Marketing today is out of control. There are so many new techniques and tactics, so many ways to reach out and not just touch our audiences, but often to annoy them as well. So many things have changed over the last few years, but so many have not changed a bit. How do you survive this brave new world? 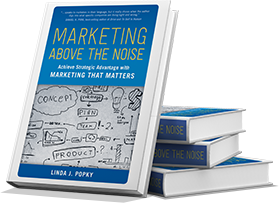 Take advantage of this special offer for subscribers of our newsletter: Buy either the hardcopy or eBook editions of Marketing Above the Noise between now and March 31st and get a free download of Linda’s CD Night Songs. Simply buy the book online or at your favorite book store. 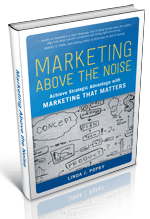 Tweet “I bought the book-Now I’m getting heard above the noise” @mktgabove or email marketing@marketingabovethenoise.com with the header: I’m getting heard above the noise. We’ll send you the code for the free download. Linda’s presentations included Marketing for Consultants at Alan Weiss’s Million Dollar Consulting College® in Newport, RI and she presented From Proposal to Publisher: Lessons on the Book Publishing Process at the SAC Annual Meeting in New York in the fall. She also presented the webinar How Women Can Be Heard Above the Noise in the Workplace for Watermark, and Overcoming the Fear of Business Success as part of the Break Through Fear and Self-Doubt Telesummit. For the 6th consecutive year, Linda was asked to judge the New Mexico Press Women Annual Communication contest. She is also a judge for the Business Marketing Association’s B2 Awards for the second year. In March, she presented to both faculty and students at the American Marketing Association’s International Collegiate Conference in New Orleans. Presentation – NorCal BMA – “Being Heard: How B2B Marketers Can Get Above the Noise in the Marketplace” – Learn more and Register. Presentation – Executive Networking Group “ExeConnect”, Campbell, CA – 10am-12pm PST. 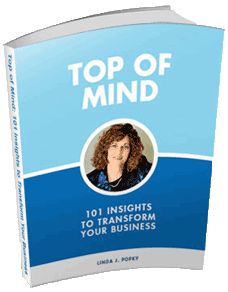 Live teleseminar by Lisa Platt of Business Networking Made Simple on “Networking Can Help You Get Heard Above the Noise,” 4pm PST. Contact Lisa to RSVP. Live Interview – on “EGG Live!” (Executive Girlfriends’ Group) with host Chicke Fitzgerald – Audio will be available after show. Presentation – First Thursdays Silicon Valley, “Being Heard: How Marketers Can Succeed in Today’s Noisy, Chaotic World,” Sunnyvale, CA – Learn more. 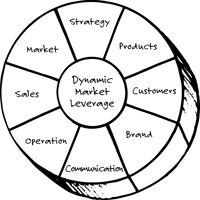 Presentation – Silicon Valley American Mktg Assn (SVAMA), 6pm PST. Learn more. Women in Consulting Speed Mentoring Meeting. Linda is one of the mentors. Learn more. 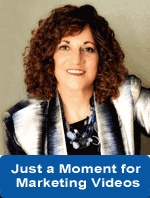 Webinar – Public Relations Society of America (PRSA).